A full course breakfast/brunch is sponsored by the Holy Name Society on the third Sunday of the month from September through April. It is served in Dostie Hall by past and present members. Not only will you be greeted by a friendly face, but your food will be delivered to your table. 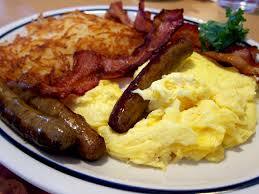 The menu includes scrambled eggs, sausages, bacon, hash browns, toast, juice and coffee. The present cost of the meals is $8 and the money is used to support the church. When pancakes or french toast is served the price is approximately $5. Breakfast/brunch is served after the 8:00 and 10:30 am Masses. Stop by and enjoy the food and the fellowship with the other parishioners. Holy Name Breakfast was honored with the Knights of Columbus attending on November 15th along with many parishioners. Enjoy the pictures with all of us enjoying the delicious breakfast.